Permian-Triassic boundary extinction was due to ice age cold, not global warming as claimed by alarmists. Earth has known several mass extinctions over the course of its history. One of the most important happened at the Permian-Triassic boundary 250 million years ago. Over 95% of marine species disappeared and, up until now, scientists have linked this extinction to a significant rise in Earth temperatures. But researchers from the University of Geneva (UNIGE), Switzerland, working alongside the University of Zurich, discovered that this extinction took place during a short ice age which preceded the global climate warming. It’s the first time that the various stages of a mass extinction have been accurately understood and that scientists have been able to assess the major role played by volcanic explosions in these climate processes. This research, which can be read in Scientific Reports, completely calls into question the scientific theories regarding these phenomena, founded on the increase of CO2 in the atmosphere, and paves the way for a new vision of Earth’s climate history. Teams of researchers led by Professor Urs Schaltegger from the Department of Earth and Environmental Sciences at the Faculty of Science of the UNIGE and by Hugo Bucher, from the University of Zürich, have been working on absolute dating for many years. They work on determining the age of minerals in volcanic ash, which establishes a precise and detailed chronology of Earth’s climate evolution. They became interested in the Permian-Triassic boundary, 250 million years ago, during which one of the greatest mass extinctions ever took place, responsible for the loss of 95% of marine species. This is welcome news, but the evidence is rather indirect. Intense cold followed by warming would stress a lot of terrestial life, but wouldn’t the oceans moderate that effect on marine life? Large amounts of sulphur dioxide (and presumably sulphur trioxide) would affect the ocean pH far more than CO2 could. As some of you know, l’ve been on a co2 rant. What did the IPCC know and when did they know it. So, I was going on about Al Gore leaving out a critical piece of information in his famous speech about if ” we go back in time “. Well he left out the little piece about co2 lagging temperature by 800 years. Then it dawned on me, I have the old temperature record going back 1000 years, before the IPCC fixed it. Wouldn’t you know right in the middle of a great big o warm blob 800 years ago is where we are in co2. I really couldn’t figure out what was happening with the co2 levels. The temperature rise from then and the co2 record from the last 150 years look like they could pass for twins. I get my best material sometimes watching global warming stuff. I was watching a you tube video about a geologist. The thing ended and I can’t retrieve his name. To make a long story short, he was talking about aphellion and perihelion. He said something that really got my attention. Between the two, solar flux varies as much as 6% and at 65 N 25%. I thought wow, that’s a lot. I’ve never seen those kind of numbers on SORCE . So 6 % works out to 81 W/m^2 swing. Now, the IPCC claims that solar flux is no more than 0.012%. So not trusting anyone’s word on, I used 1370 w/m^2 at both the distances in relation to the 5 million km difference, ( I think it really about 1360, I erred on the side of caution) so using the formula at both, when it’s a and p , 158 million km and 153 million km, so in one direction where it was 1370 the difference was 35 w/m^2 and in the other 91. So knowing there are some 1st class mathematicians on here, if you would check . And check against the SORCE data. I didn’t see any averages in SORCE. The smallest at 35 w/m^2 is enormous. 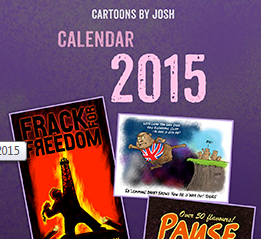 If you think it’s worth checking out. The geologist also didn’t factor in the 800 year lag of co2. It was all about the co2 and temperature in the geologic record. 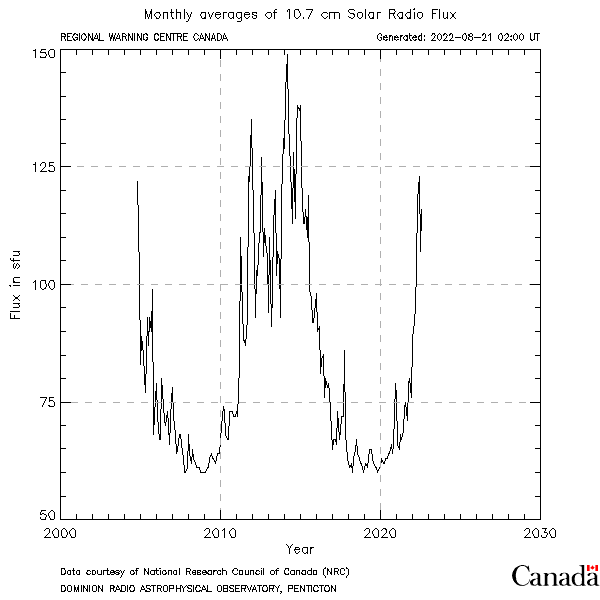 The solar radio flux at 10.7 cm (2800 MHz) is an excellent indicator of solar activity. Often called the F10.7 index, it is one of the longest running records of solar activity. The F10.7 radio emissions originates high in the chromosphere and low in the corona of the solar atmosphere. The F10.7 correlates well with the sunspot number as well as a number of UltraViolet (UV) and visible solar irradiance records. The F10.7 has been measured consistently since 1947, first at Ottawa, and then at the Penticton Radio Observatory in British Columbia. Unlike many solar indices, the F10.7 radio flux can easily be measured reliably on a day-to-day basis from the Earths surface, in all types of weather. Reported in solar flux units, (s.f.u. ), the F10.7 can vary from below 50 s.f.u., to above 300 s.f.u., over the course of a solar cycle. The F10.7 Index has proven very valuable in specifying and forecasting space weather. Because it is a long record, it provides climatology of solar activity over six solar cycles. Because it comes from the chromosphere and corona of the sun, it tracks other important emissions that form in the same regions of the solar atmosphere. The Extreme UltraViolet (EUV) emissions that impact the ionosphere and modify the upper atmosphere track well with the F10.7 index. Many Ultra-Violet emissions that affect the stratosphere and ozone also correlate with the F10.7 index. And because this measurement can be made reliably and accurately from the ground in all weather conditions, it is a very robust data set with few gaps or calibration issues. Observed increases in ocean heat content (OHC) and temperature are robust indicators of global warming during the past several decades. We used high-resolution proxy records from sediment cores to extend these observations in the Pacific 10,000 years beyond the instrumental record. We show that water masses linked to North Pacific and Antarctic intermediate waters were warmer by 2.1 0.4C and 1.5 0.4C, respectively, during the middle Holocene Thermal Maximum than over the past century. Both water masses were ~0.9C warmer during the Medieval Warm period than during the Little Ice Age and ~0.65 warmer than in recent decades. Although documented changes in global surface temperatures during the Holocene and Common era are relatively small, the concomitant changes in OHC are large. 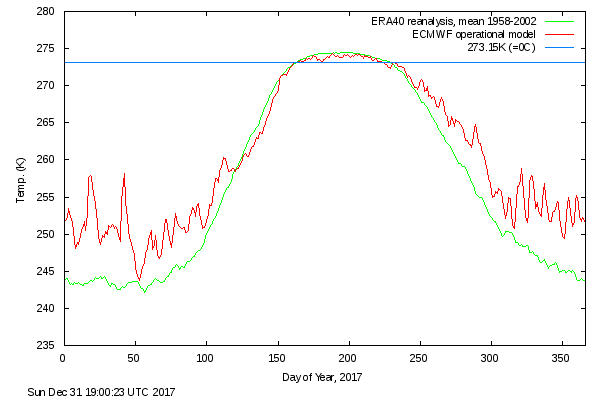 The increase in the speed of the solar wind and a drop in temperature in the stratosphere. 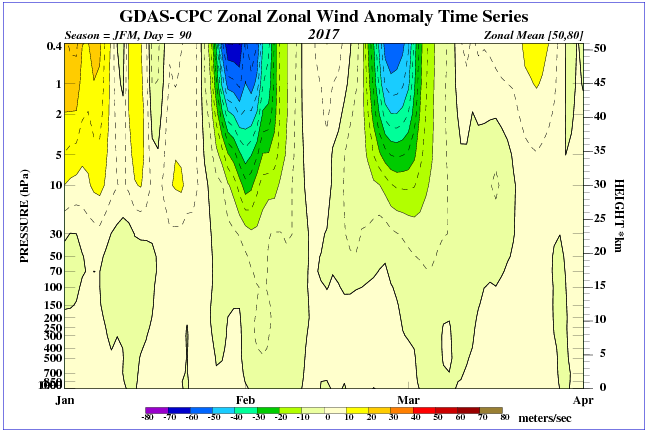 Waves in the stratosphere precede the pressure anomalies. 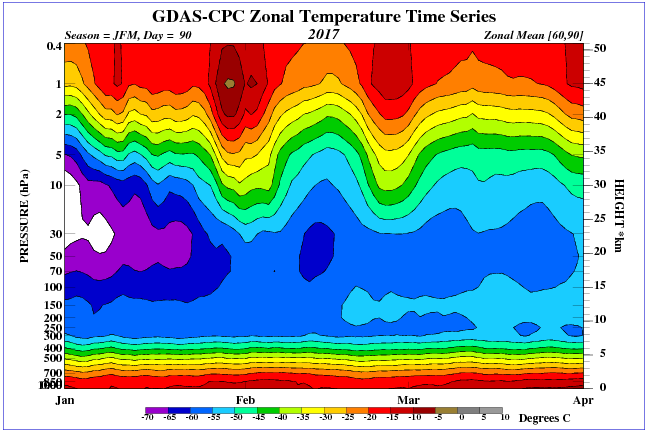 Operational SST Anomaly Charts for 2017. 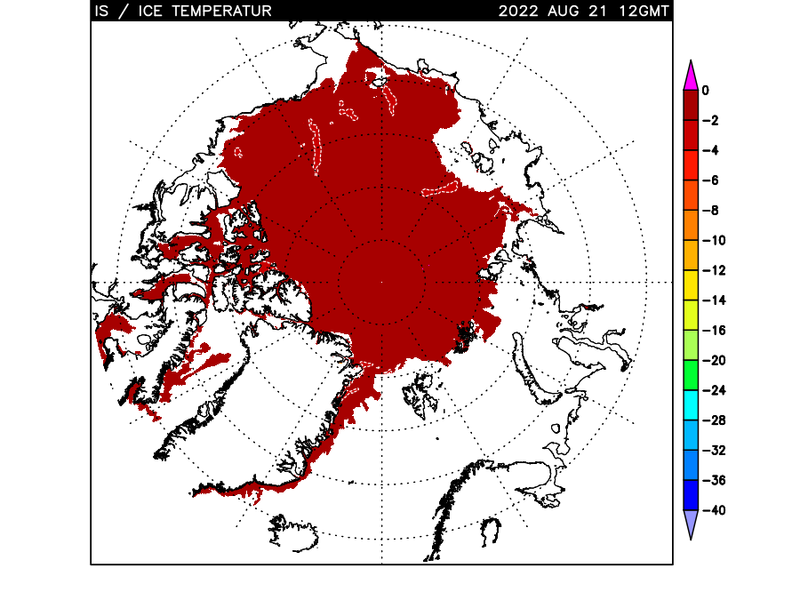 Temperature of ice in the Arctic. Is per week winter will move to the eastern US? 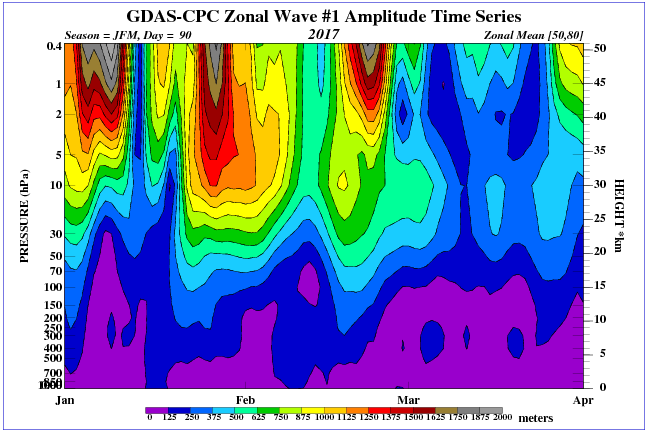 Strong wave temperatures in the stratosphere. 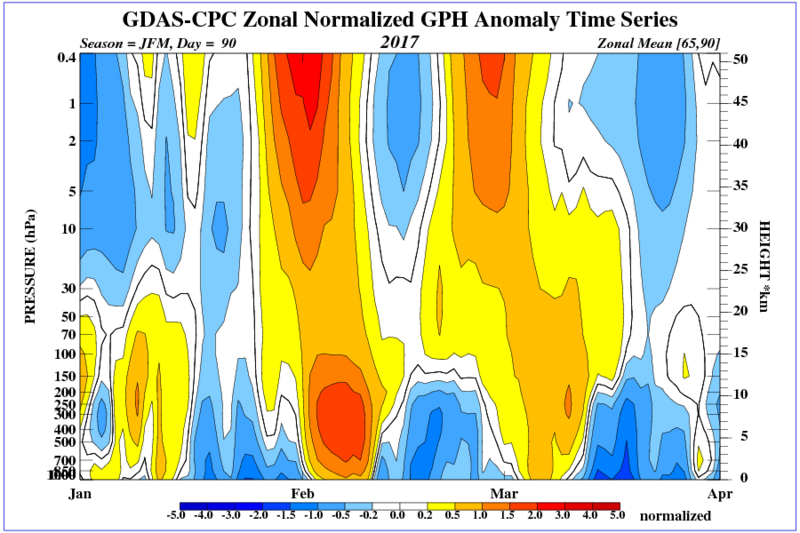 The forecast distribution of ozone in the tropopause shows the course Jetstream. You can see how it will be attacked eastern North America.